Certified Inspector, Paul A. Perry inspects your both your personal property and commercial property so that you can know exactly what you are buying. The web server with the IP-address 108.167.181.242 used by Certifiedinspections.net is owned by thefreshfoodchef.com and is located in Houston, USA. 13 other websites are located on this web server. Most of them are provided in the english language. Only a few websites on this web server are x-rated. 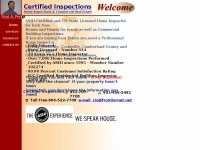 The websites of Certifiedinspections.net are served by a Nginx server. The website does not specify details about the inclusion of its content in search engines. For this reason the content will be included by search engines.